Burger King launches a BACON Sundae! It's like the folks at BK watched Rhett and Link's "Rub Some Bacon On It" video and took it to heart! This video features yours truly as I try the new Burger King Bacon Sundae for the first time. Here's another shirt that deserves a look. Don't forget that with Zazzle you can add this image to a shirt that's as inexpensive as $14.95! Here's another Tee from Zazzle that makes me smile. Your new "Bacon is Meat Candy" tee could be just the ice breaker you need to get a conversation started with the gal behind the counter at Starbucks. No, wait, I think she's vegan. Dude, you are better off without her. Try wearing this to a BBQ joint instead. They'll really dig it, and you'll enjoy the attention. BTW, I noticed that it is available on several different shirts, but remember that most all tee shirts on Zazzle can be manipulated to different styles, colors, etc. Oh, and there's a mug too! 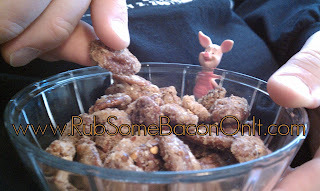 Here's a simple yet effective tee shirt with the world-changing message "Rub Some Bacon On It". Notice that there's not even an exclamation mark on it, which goes to show that there's no need to yell such universal wisdom. If you aren't familiar with Zazzle, you can select any shirt style, size and even change the font style to suit your taste and your budget. I've purchased several shirts and a couple hundred mugs from them and they always do a great job. Actually, there was one goof-up on a tee shirt, but they made it right quickly and even let me keep the irregular shirt. Check them out. Bacon. It's what's for Breakfast, Lunch and Dinner. "Wakey Wakey, Eggs and Bakey" They say that the beast part of waking up is Folgers in your cup, but few things wake me with a smile quite as well as the smell of bacon on the stove. This line is actually spoken by Michael Madsen as Budd in Kill Bill 2.